When I write, I choose to face the discomfort of writing. I step out of my comfort zone. The hardest thing is to walk through the barrier of frustrations that have accumulated for decades. My most intense frustration is that after more than ten years of almost daily writing practice, I still never feel like writing. So writing always makes me step out of my comfort zone. Yet, writing is also a way of taking care of myself and moving toward what matters to me, through my actions. Broadly speaking, taking care of myself often involves stepping out of my comfort zone. And for you? 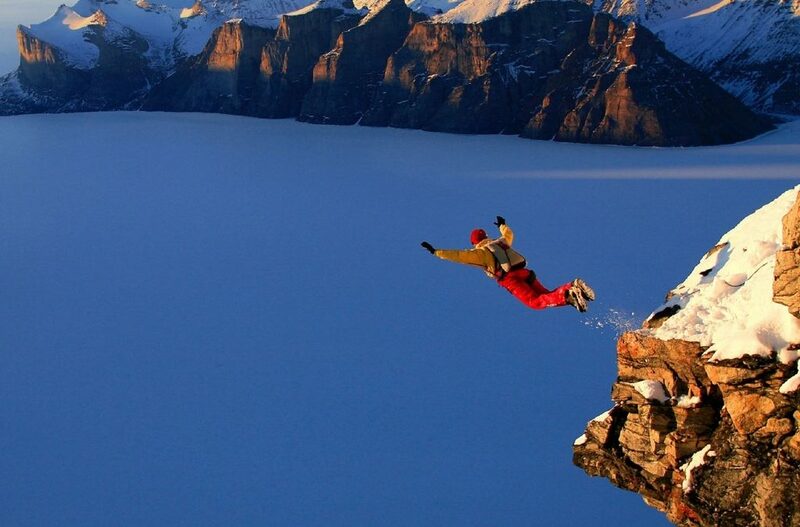 If you are comfortable in your life, maybe you don’t see any reason to step out of your comfort zone. Maybe you already have the deep and secure relationships you long for. Maybe you can easily connect to others and their support when the going gets tough. Perhaps you have found your path and are able to walk it through your daily activities. Maybe you know how to enjoy life and have a satisfying and nurturing hobby. Perhaps you have long ago adopted practices that allow you to best care of your health, your body and your mind. If this is the case, no need to step further outside of your comfort zone. You have fully found your way. And you have no need to read this blog. Wait for the next one instead. I imagine that if you have managed to create such a life for yourself, there is a good chance that you have learned through experience that the life you want to live begins at the end of your comfort zone. It’s just that you already know how step out of it and create the life you want. If not, let’s start with the first of our 52 cards. It invites us to step out of our comfort zone so that we can reach the zone where the magic happens. I cannot predict the exact distance between your comfort zone and the zone where the magic happens. However, having for many years studied the relationship between these two zone, whether through my personal experience or in my professional role of helping clients put their values in action, I have identified a third zone, your self-care zone. 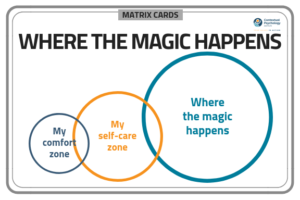 I can assure you that there is a place, both out of your comfort zone and inside your self-care zone, that reaches the zone where the magic happens. According to my observations, there is also an area inside of your comfort zone that stands firmly outside your self-care zone. Maybe it’s the habit of staying in front of a screen instead of exercising? Maybe it’s a tendency to not express your needs to those you love? Maybe even the habit of not sharing your real opinion with your co-workers? Such habits that can become comfortable but prevent us from taking care of ourselves. If you find yourself hesitating between two steps outside of your comfort zone, I advise you first to choose the smallest, and notice what happens before taking a step further. In other words, I invite you at all times to make self-care your first priority. For each blog in this series, I invite you to explore a noticing exercise. The exercise I now invite you to practice is to notice at least once a day a step you take out of your comfort zone and inside your self-care zone. If you wish, you can share your observations below. 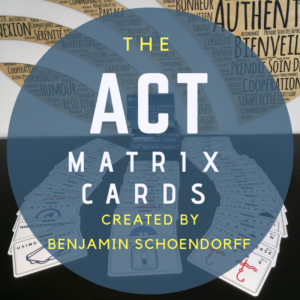 If you wish to buy the ACT Matrix cards that will guide you on the way, click here. And if you feel you or your team or organization need personalized support to put your values in action, contact us.